= Elliptio folliculata (Lea, 1838). — Williams et al. (2017). = Elliptio folliculatus. — Perkins et al. (2017). 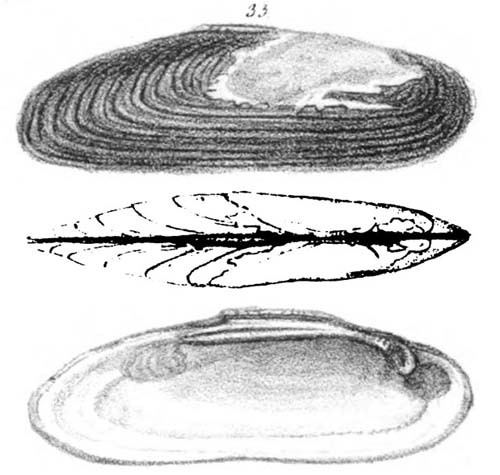 = Elliptio folliculata. — Haag (2012). = Elliptio folliculata (I. Lea, 1838). — ITIS (2012). = Elliptio folliculata (Lea, 1838). — IUCN (2011). = Elliptio folliculata Lea, 1838. — Bogan (2010). = Elliptio folliculata (Lea, 1838). — Graf & Cummings (2007). = Elliptio folliculata (Lea, 1838). — Bogan (2002). = Elliptio folliculata (Lea, 1838). — Turgeon et al. (1998). = Elliptio folliculata (I. Lea). — Williams et al. (1993). Lea, 1836, Synopsis Fam. Naiades: 34 [nomen nudum]. Lea, 1838, Trans. Amer. Phil. Soc. : 38, pl. 11, fig. 33. 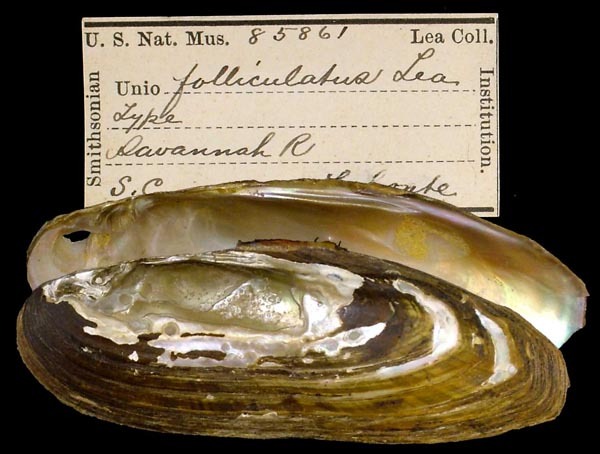 Type(s): HOLOTYPE USNM_85861, Savannah R., S.C.
Lea, 1872, Proc. Acad. Nat. Sci. : 157. Lea, 1874, Jour. Acad. Nat. Sci. : 41 , pl. 14, fig. 38. 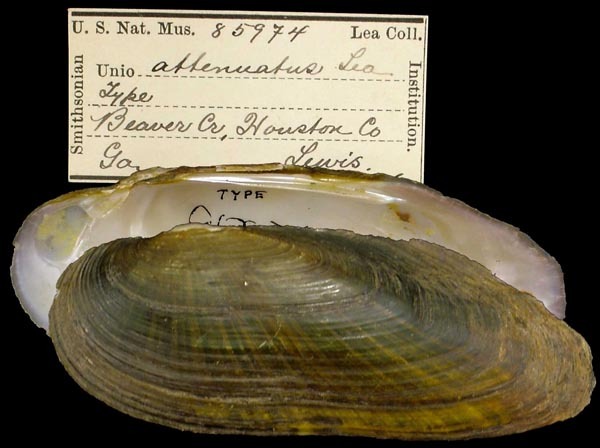 Type(s): HOLOTYPE USNM_85974, Beaver Cr., Houston Co., Ga.
Lea, 1872, Proc. Acad. Nat. Sci. : 159. Lea, 1874, Jour. Acad. Nat. Sci. : 45 , pl. 15, fig. 43. 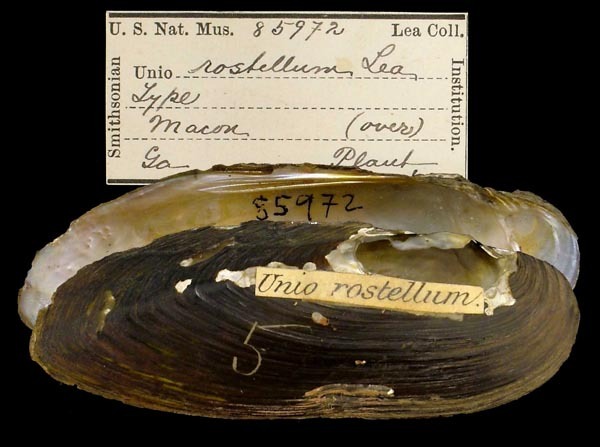 Type(s): HOLOTYPE USNM_85862, Savannah R., at Gov. Hamilton’s, Georgia. Lea, 1872, Proc. Acad. Nat. Sci. : 160. Lea, 1874, Jour. Acad. Nat. Sci. : 44 , pl. 15, fig. 41. 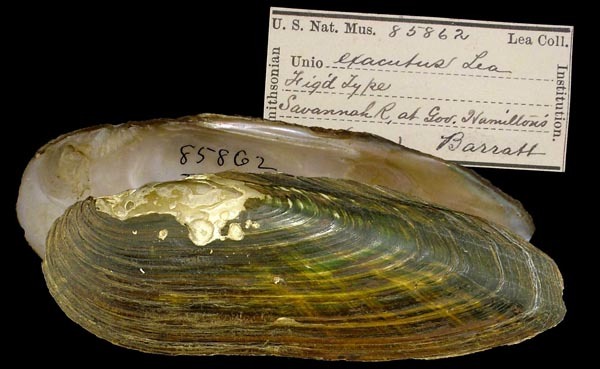 Type(s): HOLOTYPE USNM_85972, Macon, Ga.